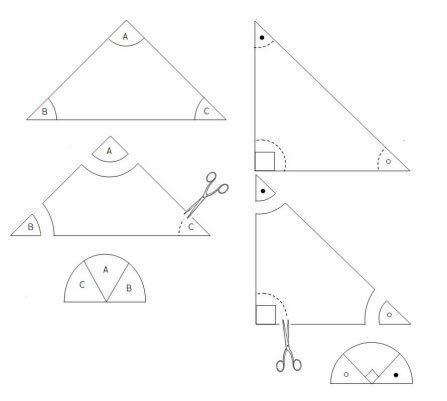 Examples, solutions, videos, worksheets, stories and songs to help Grade 6 students learn that the angles of a triangle always add up to 180 degrees and to use that concept to find missing angle in a triangle. To illustrate that the sum of the interior angles of a triangle is the same for all triangles in a visual manner, we can create several large triangles of varying shapes and sizes on construction paper. Use a protractor to trace an arc between the arms of all three angles of each triangle. Cut the corners off each triangle along the curved arc. Arrange the three corners so that they are all joined at the vertex forming a straight angle. We will see that when the three corners are arranged at a common vertex the three angles form a half circle (180°). By using triangles of various sizes and shapes we can see that the sum of the three interior angles will always be 180° for all triangles. Cutting the corners of the triangles in an arc and labelling the vertices with letters or symbols will avoid confusion as to which vertices need to be adjacent when aligning the angles. The curved edges also provide a clearer visual that the three interior angles of any given triangle form a half circle. equal 180° exactly but is very close. This could be due to error in measurement. We observe that no matter how we change the shape and size of the triangle, the sum of the interior angles will always be 180°. Visual illustrations of the sum of triangle angles. We can extend this concept of triangle sum to find a missing angle in a given triangle when two other angle measures are known. The unknown angle measure can be determined by subtracting the sum of the two known angles from 180°. How to find missing angles in scalene triangles, isosceles triangles and equilateral triangles?